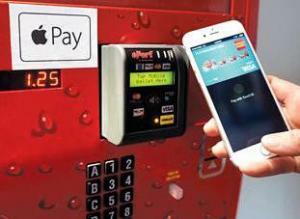 USA Technologies: Nearly 300,000 Vending Machines Accept NFC; Apple Pay, Android Pay Drive Demand | NFC Times – Near Field Communication and all contactless technology. USA Technologies projects it will be serving more than 400,000 unattended card POS terminals next year and 500,000 the following year. The vast majority will support contactless and mobile-NFC payments. NFC Times Exclusive Insight – U.S.-based unattended retail payments company USA Technologies had nearly 300,000 NFC-enabled cashless payment terminals connected to its network as of the end of the 2015 fiscal year and expects that to grow strongly next year, as mobile-payments services such as Android Pay roll out, the company said. USAT claims that 100% of its new ePort connections are now NFC-enabled readers. Article has about 1020 words.